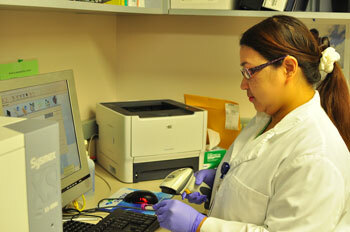 Diagnostic and screening tests that your medical provider may order can be done in our well-equipped laboratory. The laboratory at Howard County Medical Center uses state of the art, automated equipment to perform chemistry, hematology, coagulation, transfusion services, and other clinical laboratory tests. Even if a patient is seeing a physician at another location, the patient can usually arrange to have the lab test performed at Howard County Medical Center and have the results sent to the treating Physician. The laboratory does over 100,000 tests per year. Due to their increased workload and extreme importance to our facility, the lab was an area that was remodeled. As a result of the remodel, the lab has increased spaced for equipment and testing and is in close proximity with our Emergency Room.